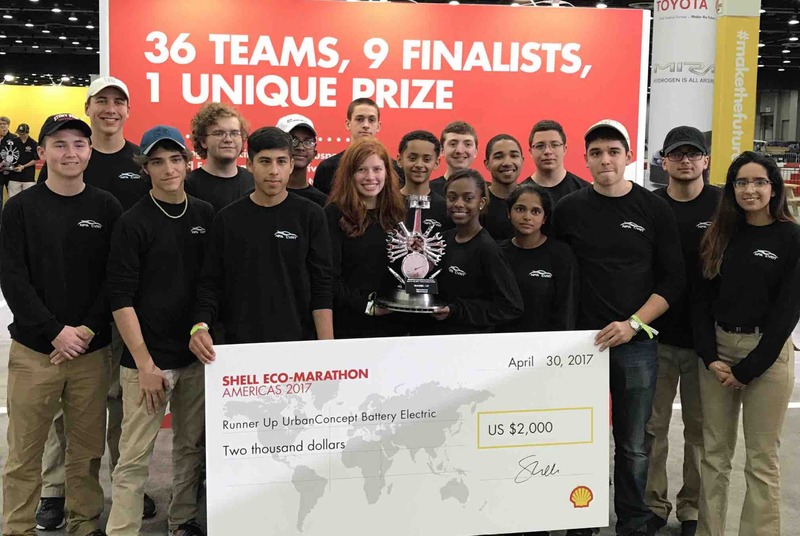 The Newburgh Free Academy Concept Vehicle Racing Team (NFA CVRT) earned 3rd place at the 2017 Shell Eco-Marathon (SEM) Drivers World Championship of the Americas on April 30, 2017 in Detroit, Michigan. The 3rd place finish qualifies NFA CVRT to represent the United States in the second annual 2017 SEM Drivers World Championship to be held in London, England from May 25-28, 2017. This competition is based around maximizing fuel efficiency and it now will also incorporate a new dimension to the competition by adding a speed race. NFA CVRT was one of only 3 teams selected from the 114 teams from North, Central and South Americas who participated in Detroit. In the SEM Drivers World Championship there will be 9 teams from the entire world competing for the title of the “worlds fastest and most efficient driver”! For more information about our vehicles and this years qualifying event, you can watch our daily progress by going to the Goldback Television channel on YouTube. Newburgh Free Academy is a public high school in Orange County, New York. NFA CVRT is comprised of 9th-12th grade students who strive to gain engineering related experience for their future endeavors beyond high school. Students work directly with teachers in the Career and Technical Education department, such as Engineering, Automotive Technology, Welding, Auto Body, and Video Production to name a few, which are all elective opportunities for every student who attends Newburgh Free Academy. The team is a self-funded, after school activity, which has been supporting itself through the design and building of vehicles. NFA CVRT plans on raising the money needed to send 15 team members to London to compete in the 2017 Drivers World Championship! We are, therefore, asking all of our supporters and friends to make a donation at this time, so that the team can accomplish our goal of bringing home prestige and fame to the NECSD, the Greater Newburgh area and by extension all of the United States. All the money raised here will go directly to getting our team members to the Drivers World Championship in London, England. Sponsors who donate $250 or more will be listed on our team uniforms! Sponsors who donate $1000 or more will be listed on our vehicle! Here at NFA, our students are making global changes to create a better future for all! Wow! More than half way there!!! Thank you everyone for donation! We will be hosting a fundraiser at the Newburgh Elks Lodge tomorrow afternoon! If you can make it we would love to have you there. Thanks again everyone!!! Thank you to everyone who has contributed this far to our campaign! We are almost halfway to our goal of $10,000!! It is a great honor having our community come together to help support us! 14 more days until the competition, wish us luck!!! !